Whipped Lentil Chipotle Dip – this incredibly flavorful dip is so smoky smooth! a super quick and easy recipe for an appetizer or sandwich spread! If you have been wanting a unique and incredibly flavorful dip and spread, search no more. I know I often say things like this recipe has been made multiple times (three so far, for this particular dip), it has amazing flavor and everyone will love it (it does, and so far several folks will agree), and so on. I know… how can I say that about every recipe? Well, you know by now I am enthusiastic about food, sometimes animatedly so. Still – please believe me on this one – not only is this a quick and easy recipe, it has a sweetly smoky flavor and a light, whipped texture. This Whipped Lentil Chipotle Dip is perfect for dipping all manner of crackers and crudité, and it makes a great sandwich spread too! This rave worthy recipe is one of a bunch of fabulous recipes in Laura Wright’s new book, The First Mess Cookbook – Vibrant Plant Based Recipes to Eat Well Through the Seasons. First, she used the word vibrant, you know I love that. Second, her blog name ‘The First Mess’ comes from M.F.K. Fisher, one of my early inspirations. The day this cookbook arrived on my doorstep, my afternoon was spent reading cover to cover. This book is a stunning work filled with gorgeous photos and thoughtful, well constructed recipes. I have made a handful of recipes already, with remarkable results. What I have already tried: No Bake Salted Peanut Butter Cookies – quick, easy, and delighted a meeting room full of people! Gingered Brussels Sprout Potstickers – super fun to make (my first time) and fed our small Oscar Party crowd. Burrito Stuffed Sweet Potatoes – I mean, right? This was the first recipe I tried. Delectable comfort food. and because I’ve never met a French toast I didn’t love, the Toasty French Toast Bake. Mmm hmm. Right now, this work of art is sitting top of the stack of books on our coffee table. Long term, though – this will be a fixture in our kitchen, because I have barely begun to make the magic within. Place the lentils in a medium saucepan and cover with 3 cups (750 ml) filtered water. Bring to a boil over medium high heat. Lower to a simmer and cook until lentils are mushy and falling apart, about 8 minutes. While the lentils are cooking, combine the garlic, chipotles, adobo (if using), cashew butter, lemon juice, tomato paste, and cumin in blender. Drain the cooked lentils, and scrape them into a blender with the garlic and chipotle mixture. Season with salt and pepper. Whiz everything on high until the dip is completely smooth. You may have to stop the blender and scrape down the sides a couple of times. The dip will be quite warm. For optimal serving, scrape the dip into a container and cover it with plastic wrap, pressing onto the surface of the dip. Refrigerate the dip for at least an hour before serving. Garnish the top of the dip with a drizzle of olive oil, extra ground cumin, and a sprinkle of paprika. This is very tasty & versatile as it can be used for a dip or a spread. I used two chipotle peppers, No additional sauce. I didn’t have cashew butter, so used almond butter. For a bit less heat only use 1 or 1 1/2 pepper. Yummy & super easy to make, thank you for sharing the recipe!!!! 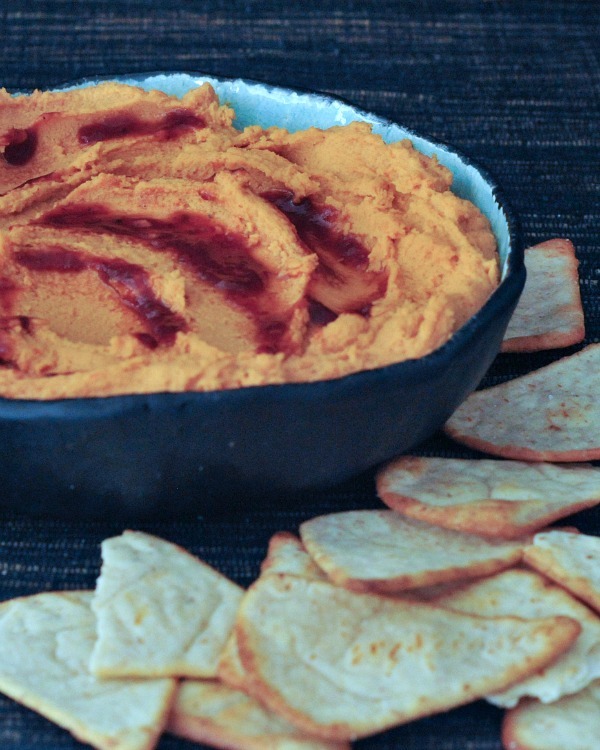 Oh, I love red lentils, and that’s such a good idea to use their innate creaminess for a dip. I’d never heard of The First Mess before this blog tour, but all of the recipes I’ve seen across the blogosphere look terrific! I have this book but I haven’t made anything yet! I need to give this recipe a try – it looks so tasty! i already love this dip, just from the first three ingredients: red lentils, garlic, chipotle… I also love how healthy it is – I will definitely give it a try soon – can’t wait!! Oh my gosh, Kristina. This looks soooo good! I need to make it ASAP! I absolutely LOVE incorporating lentils into my diet and this si a great way to do just that. Must try!